The iConverter 4GT is a four-port 10/100/1000 Ethernet switch, available as a compact unmanaged standalone unit or a managed chassis plug-in module. The plug-in modules offers networking features including rate-limiting, traffic classification and prioritization, and VLAN capability. The four RJ-45 ports support 10/100/1000Mbps bridging, Half/Full-Duplex and auto-negotiation. These features are configurable using DIP-switches or through software management. The 4GT supports RJ-45 auto-crossover (MDI/MDI-X) on all four ports, eliminating the need for a crossover cable and facilitating connectivity to different types of Ethernet equipment. The hot-swappable plug-in module can be mounted in a 19 or 5-Module iConverter chassis with redundant AC and DC power supplies. It can also be mounted in a 2-Module AC or DC powered chassis, or in a 1-Module chassis with AC or DC power input. Two Ethernet backplane ports provide connectivity to adjacent modules in the same chassis. The 4GT supports traffic prioritization according to Class of Service (CoS) prioritization scheme. Incoming frames are assigned to one of four egress queues based on the VLAN tag P-bit value. This allows high priority traffic, such as voice traffic, to egress the network with no impact from lower priority traffic during congestion. The 4GT standalone unit is available with an external AC to DC power adapter or with a 2-pin terminal connector for direct connection to DC power. The 4GT is part of the iConverter multi-service platform, and can be installed in a chassis equipped with iConverter Network Interface Devices, media converters, transponders and CWDM multiplexers. The multi-service platform is capable of delivering Ethernet, TDM, SONET and other services across a wide area network. iConverter modules can be added to this scalable architecture to expand bandwidth capacity and add new services. The iConverter 4GT plug-in module can be used in managed or unmanaged applications. Management provides remote configuration, monitoring and trap notification. Management of the plug-in module is accomplished by installing an iConverter Management Module (NMM2) or Network Interface Device (NID) in the same chassis. The Management Module can be accessed via SNMP, Telnet, and serial port. The 4GT can be managed with Omnitron’s intuitive, graphic-oriented NetOutlook SNMP Management Software or third party SNMP management software. Management via the Telnet and the serial interfaces have an easy-to-use, menu-driven interface. The management software can override the physical DIPswitch settings such as auto-negotiation, Half or Full-Duplex, and backplane selection, and remotely configure additional parameters including rate-limiting, VLAN and Port Access Control. Some of the real-time 4GT parameters that can be monitored include duplex mode (Half, Full), link and data activity status. Other parameters include module type and model, hardware and software revisions, serial numbers and a user-defined identifier. The port MIB statistics include transmit and receive packet counts and error counts. The iConverter 4GT supports SNMP trap notification for the monitoring and notification of different network events. Specific events that generate traps include module insertion and removal, and port link-up and link-down. Trap monitoring of specific events can be selectively enabled or disabled by the network management software. The iConverter 4GT supports the IEEE 802.1Q tag Virtual Local Area Network (VLAN) packet tagging and untagging (including Q-in-Q) and the 802.1p Quality of Service priority standards. 4GT VLAN 802.1ad tunneling technology enables service providers to offer their customers E-Line and E-LAN services (via Ethernet Virtual Circuit or EVC), which connect multiple business LANs at different locations and make their networks appear to be on the same local network. Q-in-Q Service tags transparently transport customer network traffic across the service provider network, isolating it from other customer and service provider management traffic. The 802.1p prioritization standard enables delivery of Quality of Service (QoS) to high-priority, real-time applications such as voice and video over Ethernet. Port VLAN enables the ability to specify and restrict traffic flow between the RJ-45, backplane and management ports. The enhanced Bandwidth Control feature supports bandwidth limiting for the RJ-45 ports in 64Kbps increments from 64Kbps to Full Line Speed. The 4GT features Port Access Control which blocks user service while maintaining the network link. Port Access Control enables the network administrator to control user access while maintaining port configuration for easy disabling or enabling of user service. Port Access Control provides administrators the capability to improve network security by controlling port access when the port is not in use. The 4GT supports reporting of utilization and port statistics. Port statistics are available with 38 different variables for each port. Port statistic reporting provides the ability to monitor bandwidth utilization and network performance for each individual port. 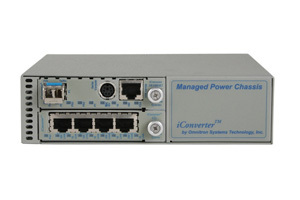 iConverter compact chassis support Ethernet backplane connectivity between plug-in modules. Modules can be combined to create configurations that provide multi-port Ethernet connectivity to end users and subscribers. The example below illustrates a 4GT module and a GX/TM2 intelligent media converter installed in a 2-Module chassis. This configuration provides a Gigabit fiber uplink and five managed 10/100/1000BASE-T ports.